Jeromy Nelson, Darien High School Technology and Engineering Education Department Coordinator, accepts the Connecticut Technology and Engineering Teacher of the Year Award in Washington, D.C.
A local educator recently picked up a national honor in Washington, D.C.
Darien High School Technology and Engineering Education Department Coordinator Jeromy Nelson was awarded the Connecticut Technology Education and Engineering Teacher of the Year Award from the International Technology and Engineering Education Association on March 3. 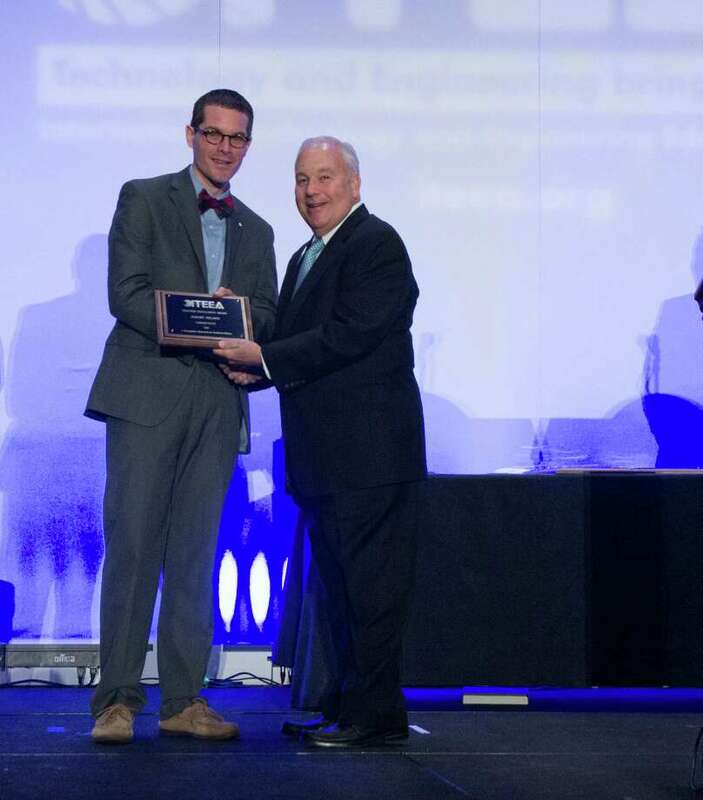 The award recognizes outstanding technology and engineering teachers who “will serve as models for their colleagues and who could form a leadership core to affect change in the field.” It is said to be one of the highest honors given to technology and education classroom teachers. Nelson oversees technology, engineering, business and computers for grades 6 through 12 in the Darien Public Schools. “Our kids are taught to think critically from an early age,” Nelson said. And, because of the independent nature of the school system’s technology projects, Nelson said it’s crucial to cultivate a nurturing environment. Nelson has been teaching technology and engineering classes in Darien for 13 years. “In all my classes it’s important to build a community,” Nelson said.